Jumpin’ Jehosaphat! The etymology of this saying is not readily available, but I did find this here. Take it for what it’s worth. This house sits rather prominently on Route 66 (across the street from Kidcity (CTMQ Visit here) in the midst of some much more recent development. 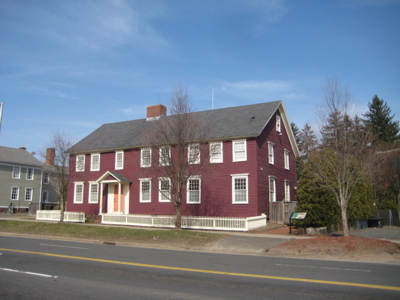 Built in the 1750’s, it has been home to several prominent Middletowners. 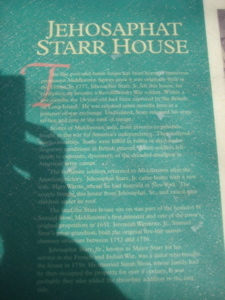 Jehosaphat Starr, Jr. left this house – his birthplace – to join the Revolution in 1777. He was promptly captured by the British and held captive on Long Island. Through luck, he was chosen for a POW exchange and returned to the revolutionaries at which time he promptly suited back up and joined the fight, rising to the rank of ensign. He survived the war for independence (unlike many of his Middletown brethren) and brought back a wife to this house which he bought from his dad. The land was originally part of Samuel Stow’s landlot. Y’know, Samuel Stow, the first minister in the history of Middletown. Stow’s great-grandson built the five-bay center chimney house. I can’t quite sort out the whole Stow-Starr family history here, but Jehosaphat Sr. married a Stow daughter and she had thirteen kids here, seven of which died before adulthood. A bunch are buried over at Middletown Heritage Trail site 5, the Riverside Cemetary. Senior was a French and Indian War veteran… This was one tough lineage. While Middletown was fiercely pro-independence, there were a few Tories in town loyal to the Crown. 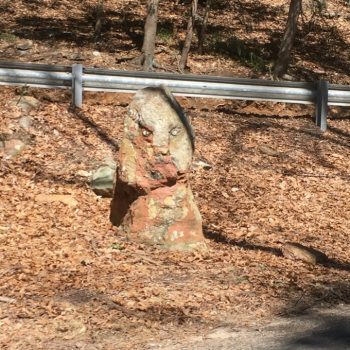 We’ve learned a lot about the various treasonous Connecticut Tories around the state, but the most interesting spot so far has been Tory Den in Burlington (CTMQ Visit here). There were a couple tories in Middletown and most were caught and prosecuted. But the best story – perhaps the best story along this whole Heritage Trail – is that Benjamin Franklin’s son William, noted British sympathizer despite his father’s urging and occupation, was cited for his activities in Middletown and held under house arrest at this very house for almost a year! He was released and promised to stay cool, but he couldn’t help himself and was caught again being a traitor to the revolutionary cause and promptly sent off to Litchfield to solitary confinement. This was all news to me, and that’s always a good thing.